Hypothetical situation - what if the Bolt did not have the Tata badge on it, would it make you look at this car a bit more keenly? Well you should. For a moment put aside the Tata badge adorning the grille and let me tell you the look Rishaad Mody had on his face when he got behind the wheel and took the Bolt out for a short spin soon after I had done the same. Incredulous! Yup, that's exactly the word to describe his expression. Rishaad couldn't, for even a moment, believe that the Bolt could be that exciting! And let me tell you just to clarify, this was in no way a proper drive. We just had a small lick of the Bolt and we can't wait to taste the whole dish. The Bolt then is what Tata Motors hopes will bring about a difference in the way it's perceived in the Indian market. The Zest sedan which came before the Bolt has already established the fact that Tata Motors can make a car that can stand up to the competition in the sub 4-metre sedan segment. 10,000 plus bookings for the Zest upto September 2014 is clear validation that the Zest has made its mark in the market. The agenda set for the Bolt however, is a bit more different and should I say, bold! Tata Motors' intentions for the Bolt are clear and daring, they want the car to appeal to those passionate about driving. They are looking to hook the enthusiast. Yes they'd appreciate the business those looking for a hatchback to commute in will bring them, but deep inside they are hoping it will set the segment on fire. So can the Bolt hope to do that? Here is what our taste buds discovered with that quick lick. Here's a good question for a conversation starter, which do you think was drawn up first by Tata Motors? The Zest sedan or the Bolt hatchback, the chicken or the egg? Conventional wisdom has shown us that most sedans are afterthoughts post a hatchback. 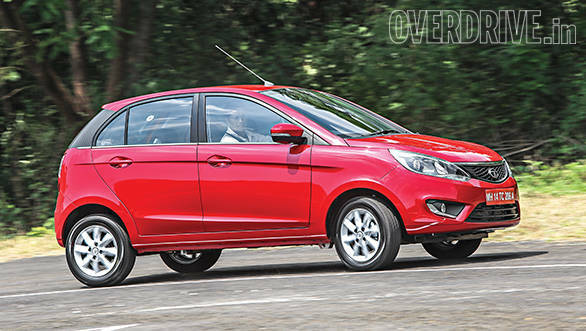 In the case of Tata Motors, the Zest sedan was the first step and then it was downsized to make the Bolt. The Bolt will remind you, in many ways, of the Indica - it has that sort of familiarity in its form. At first glance the Tata Bolt looks like the portly Gujarati kid who's been hitting the treadmills with a vengeance and has little tufts of muscle peeking out of his shirt sleeves. The Tata Bolt has got character, and that allows it to stand out. This is a car that will get noticed, there is no mistaking that positively glowing and well etched front face. The slight power bulge on the hood, the wrap-around headlamps and most of all, the bumper with the inverted smile and the scooped out recesses to house the driving lamps give it some serious aggression. This car means business and it looks the part too. Is there a difference between the Zest and the Bolt? Of course there is but nothing that you could recognise with just a glance. The specifications Tata Motors provided at the time of launch indicate minimal changes in dimensions; length, width and height. Of these three the length of the Tata Bolt obviously is the one that changes the most. At 3825mm, it's 170mm shorter than the Zest sedan. This for obvious reasons means you get slightly less boot space than the Zest but it is by no means lagging behind the competition. To make an educated guess, I'd say it still offers more space than a majority of the other hatchbacks in this segment. 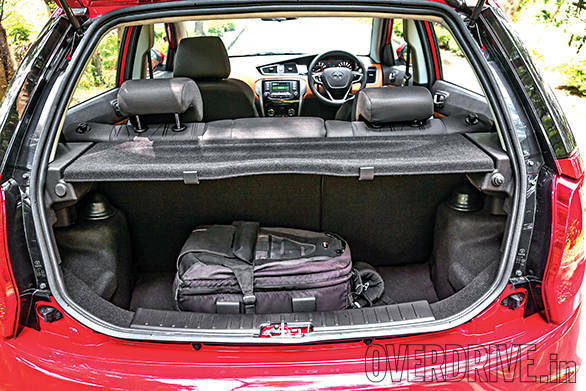 In addition and if it's useful to you, unlike in the Zest, the rear seats offer a 60:40 split, so either seat or both fold down completely to increase the boot volume. There is also a small reduction in the height (10mm shorter) and width (20mm narrower) of the Tata Bolt compared to the Tata Zest. This is due to the differences in the profile of a hatchback and a sedan. The 2470mm wheelbase and the 1450mm and 1440mm front and rear track respectively are also the same as that in the Zest so there are absolutely no changes there. 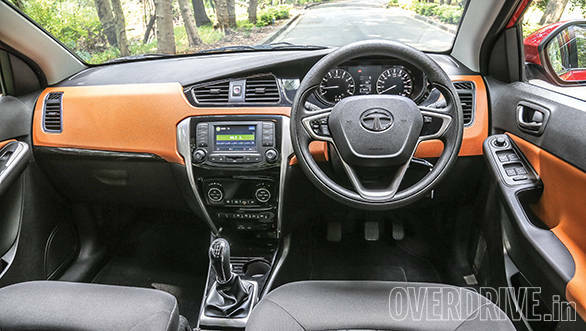 On the inside the only differentiator between the Zest and the Bolt is the trim colour and if you look at the images, you will notice the burnt orange tones injected into the door pads and the dashboard - it does add some funkiness to the interiors. While I don't entirely like the shade because I think it's a bit dull and needs a little more energy, I do think Tata Motors is on to something here. If performance is what you want to project you need some funkiness to show it and this splash of orange does just that. There's a generous amount of interior room in the Bolt, more so than the Zest because of the hatchback profile. Rishaad who is 6'1" had enough knee room in the rear passenger seat. The rear seat has also been modified to fit the hatchback mould, so the seats are a bit upright but offer decent support especially in the under thigh area beneficial on long drives. Ingress and egress are also comfortable and even if your knees aren't as young as your heart is, getting into and out of the Bolt is no issue. So the engineers working on this project worked on two critical areas, suspension and transmission. With the suspension, the aim was to get a slightly stiffer setup to improve handling. At the front you get an independently setup MacPherson system with an anti-roll bar and at the rear, it's the same thing all over again. So those two anti-roll bars have a significant part to play in the overall dynamic assessment of this car. As I mentioned earlier this isn't a full-fledged drive report - that will follow within a couple of months. So we did not get the opportunity to test these dynamic abilities and see if it does make a difference. What I can say is that the Tata Bolt felt agile and nimble and the steering precision felt spot on, though I do feel this car could do with grippier tyres. On another note, I also feel Tata Motors should have worked further on trying to reduce the weight of this car. Presently the kerb weight stands at 1,080 kilos which, for a hatchback is substantial. Two other cars that redefined weight in the hatchback category are the Toyota Etios Liva and the Honda Brio both of which have a kerb weight under 900 kilos. The Tata Bolt could have benefited hugely from that sort of a weight saving both in efficiency and performance. Instead, Tata Motors has worked on improving the drivetrain to give it the kind of performance that will complement its image. Now the engines are the same, you get a petrol and diesel both mated to a 5-speed manual transmission. 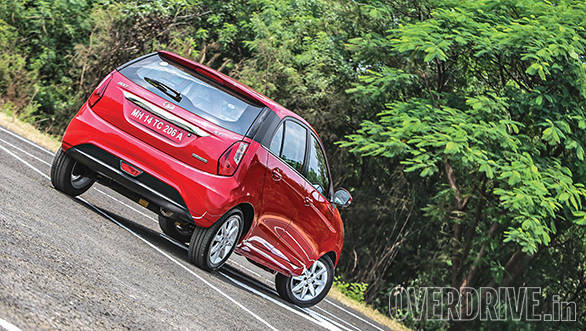 At this point in time, Tata Motors is not willing to divulge if the Bolt will have the same configurations as the Zest, especially if there will be two states of tune for the diesel. Yet it's safe to assume that the Bolt will, in addition to the 1.2-litre Revotron petrol, also get the 75PS and the 90PS 1.3-litre diesel. Tata Motors is also not willing to confirm if the AMT, the automated manual transmission that's available with the Zest 90PS diesel, will also be available with the Bolt. Again, common sense dictates the option will definitely be provided. What is of interest to us though is the turbocharged Revotron petrol engine with its three driving modes and the manual transmission. With the coming reversal in purchasing trends, the petrol engine is going to play a larger role for Tata Motors products and the turbocharged petrol is poised to lead this change. In this engine, you get 85PS of max power at 5,000rpm and not 90PS like in the Zest. Tata Motors hasn't confirmed as yet how the engine loses the 5PS, but a reply will be coming soon. Torque nonetheless stays the same at a 140Nm available between 1,750 and 3,500rpm. 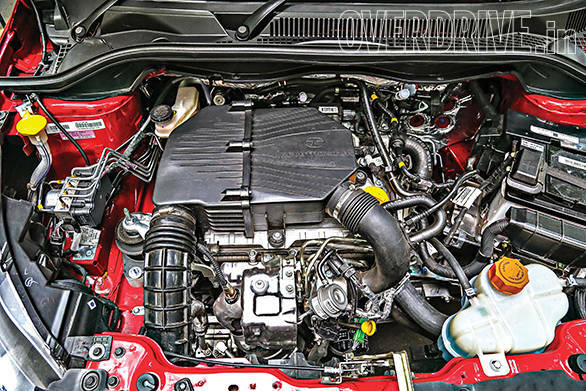 This engine is mated to the TA65 5-speed manual transmission whose ratios aren't the same as that on the Zest. Tata Motors has tweaked this gearbox for the Bolt and to provide quicker acceleration and thereby better performance, the ratios have been brought a little closer. You also get the Sport, Economy and Normal driving mode selector which essentially allows the ECU to select a different fueling map, depending on the mode selected. The Tata Bolt has tremendous potential if the customers just accept it as something Tata Motors has tried in an entirely new direction. To that effect here is an interesting bit of information I came across recently - apparently people way up the ladder within Tata Motors wanted to present the Bolt and the Zest as cars from an entirely new brand. 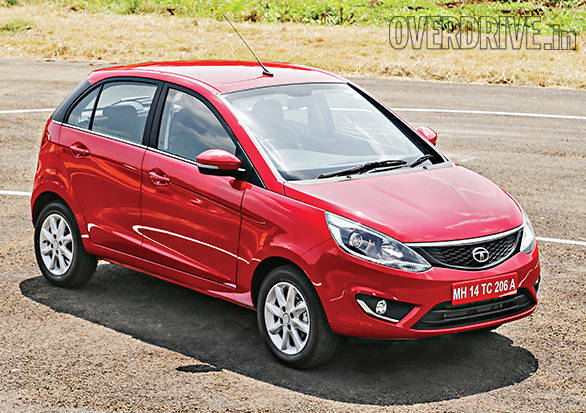 They wanted to give the Zest and the Bolt the opportunity to thrive sans some of the baggage the Tata brand carries. Had they done that, I think the Zest and the Bolt would have had a far easier route map charted out for them today. The Bolt nonetheless shows us clearly that with a broader, more global view and lots of passion, positive change is imminent. The Tata Bolt is just a precursor of the things to come from Tata Motors in the future, and there is a lot more in store. On the Bolt though, there is still a lot more we have to share with you but for that we're waiting to get even more intimate with it. We're only just warming up to it!